Pingtang County, southwest of China’s Guizhou Province. The Five-hundred-meter Aperture Spherical Telescope, or FAST, took roughly five years to complete and cost $180m; initial plans and location reconnaissance began way back in 1994. Its massive reflector, comprised of 4,450 panels covers the same area as 30 football fields. It will become operational in September and will be used to search for extraterrestrial life, but don’t expect to hear about FAST aiding in major discoveries right away. Over the next two to three years, the telescope will be subject to adjustments and used for early-stage research by scientists in China. It will then become available to researchers across the globe to use. 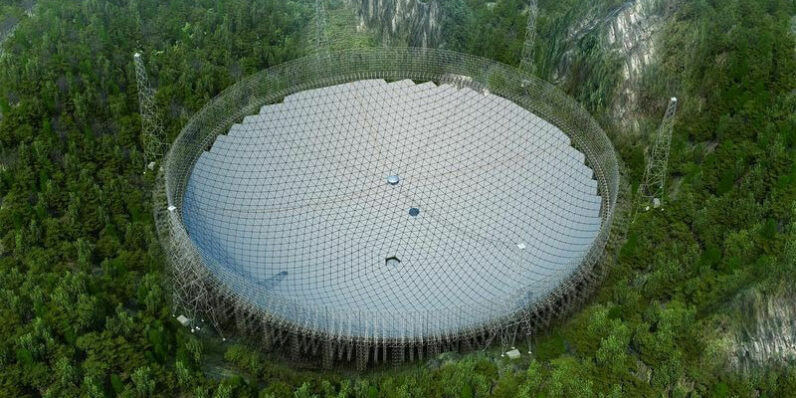 According to Xinhua News, FAST will aid in detecting pulsars, gravitational waves and eventually amino acids, which would confirm life on other planets. The telescope is much bigger than the Arecibo Observatory in Puerto Rico, which was previously regarded as the world’s largest at around 300m in diameter. In order to ensure total radio silence within a five-kilometer radius around FAST, more than 9,000 people will be moved out of the area surrounding the telescope and resettled in neighboring counties by September.